Beyond the village of Hobbiton the gentle green lands of the Shire were peppered with other hobbit dwellings: some clustered in hamlets and others standing alone. Some were typical hobbit burrows, dug into hillsides and banks, but where land was flat the small folk built above ground, roofing their homes and out-building with thatch. The Maggot family maintained a large farm where they grew corn, cabbages, carrots and potatoes, among other vegetables. Farmer Maggot kept guard dogs to watch over his crops and alert him to intruders on his property, and with good reason. 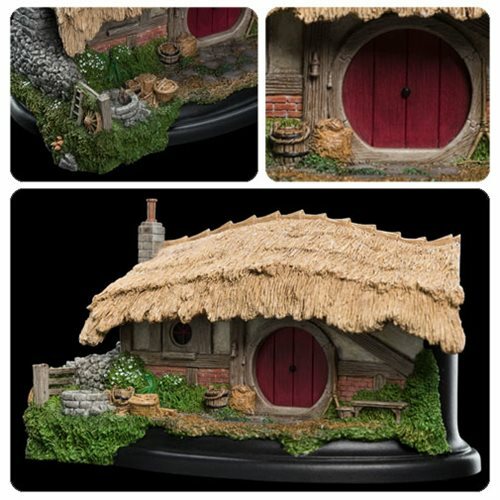 The Lord of the Rings: Farmer Maggot's Hobbit Hole Statue is Weta Workshop's very first Hobbit Hole from The Lord of the Rings! This gorgeous little environment has a flat back and shallow depth, making it ideal for placement on mantles, cornics, shelves, and in windows. Measures about 4 3/4-inches long x 2 3/4-inches tall. Each statue is painted by hand and may have slight variations.